Not practicing on Sunday due to injury were wide running back Saquon Barkley (hamstring), running back Jalen Simmons (concussion), defensive end R.J. McIntosh (unknown – Active/Non-Football Illness list), linebacker Connor Barwin (“soreness”), linebacker Calvin Munson (concussion), linebacker Thurston Armbrister (hamstring), and safety Darian Thompson (hamstring). Giants practiced in helmets and shells, without pads. 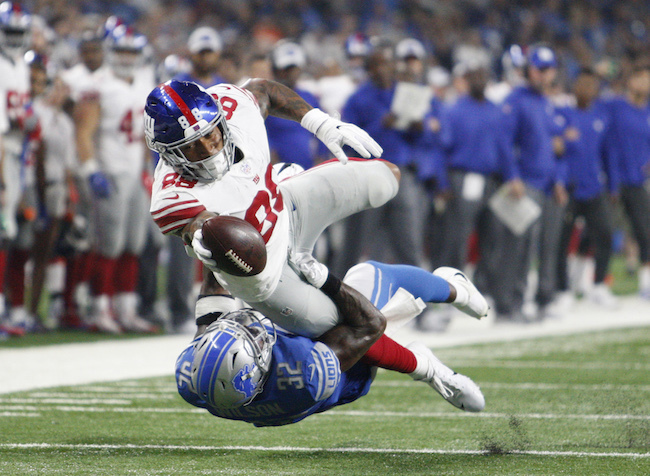 Quarterback Eli Manning threw a perfect pass to wideout Sterling Shepard, who beat cornerback Eli Apple and free safety Curtis Riley. Quarterback Kyle Lauletta connected on a deep post to wide receiver Alonzo Russell, who ran past cornerback Eli Apple. Quarterback Davis Webb threw a touchdown to tight end Evan Engram in red-zone drills on a slant pass between defensive backs William Gay and Michael Thomas. Quarterback Kyle Lauletta threw a touchdown pass to tight end Garrett Dickerson, who made a juggling, finger-tip catch against safety Orion Stewart. Wide receiver Kalif Raymond played some running back and scored on a run. The inside linebackers in the first-team nickel defense were Ray-Ray Armstrong and Alec Ogletree. Quarterback Alex Tanney connected on a long pass to wide receiver Amba Etta-Tawo. In 7-on-7 red-zone drills, quarterback Eli Manning hit wide receiver Odell Beckham, Jr. for a touchdown on a fade pass. Cornerback Grant Haley knocked away a corner throw from quarterback Kyle Lauletta to wide receiver Amba Etta-Tawo. Cornerback Leonard Johnson intercepted a pass from quarterback Alex Tanney in the end zone.